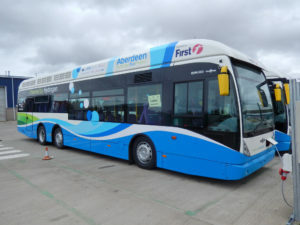 The Society of Motor Manufacturers and Traders (SMMT), a UK trade association, has recently published an interesting article on Aberdeen’s hydrogen activities, which started with the deployment of 10 fuel cell electric buses through the High V.LO-City (6 buses) and HyTransit projects (4 buses + refuelling station). The article is reproduced below. You can also find the original article here. 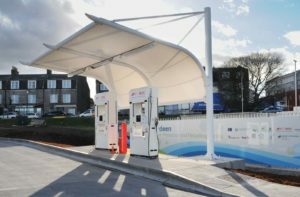 Note: Aberdeen’s second refuelling station is in operation since the end of February and the City Council has also recently deployed 10 additional fuel cell cars. More information here. Hydrogen is still discussed in the future tense. It’s often referred to as the most realistic long-term replacement for fossil fuels, because tailpipe emissions are nothing but water and you fuel and run the vehicle in the same fashion as a petrol or diesel vehicle. However, there are still some challenges that will need to be overcome – the cost of the infrastructure, price and availability of vehicles and where and how you refuel. 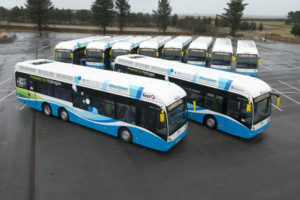 The city of Aberdeen has proved hydrogen a viable prospect for buses, though. It launched the H2 hydrogen bus project in March 2015, comprising 10 vehicles – the largest hydrogen bus fleet in Europe – and a filling station in Kittybrewster, just north of the city centre. The project has been championed by the Low Carbon Vehicle Partnership and involves a number of tie-ups between the city of Aberdeen and companies such as First Bus, Stagecoach and large power firms such as Scottish & Southern Energy and Scotia Gas Network. 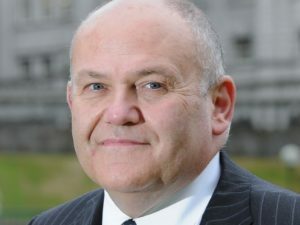 “I think one of the striking features of this particular initiative is the involvement of the private sector,” says Aberdeen City Councillor and project leader Barney Crockett, “we’re probably one of the most private sector-orientated cities anywhere in Europe and we’ve got very strong links with lots of the wider private sector companies who are involved in developing hydrogen vehicles and other forms of hydrogen. A second hydrogen filling station is already under construction in Cove, to the south of Aberdeen. It’s due to be up and running in December 2017 and will be the city’s first publically available hydrogen filling station, with the ability to top up cars and vans as well as buses. The introduction of hydrogen buses necessitated additional training for the drivers, but despite having to get their heads around the new technology, they’re still fans, according to Crockett. “In the initial stages, there were teething problems because, as with every new thing, it asks quite a lot of the drivers. They have to be at the helm of a sophisticated new process, so there are elements of the technology that needed quite a lot of training. For example, there are quite a lot of indicators [relating to the hydrogen system] that drivers have to pay attention to, and some of those require immediate responses. The transition has been easier for passengers. According to Crockett, some Aberdeen residents are actually bypassing conventional diesel buses and waiting specifically for the hydrogen ones. “People are seeing it as more akin to a train journey because you’ve got total silence; you can work on your computer on the bus, for example. Crockett admits that the perceived expense of hydrogen filling stations and the ability to produce the fuel is a big deterrent, but the hardware and the process have become cheaper over time – and the more vehicles you run, the stronger the commercial case becomes. “When we first got involved the costs were very, very high, but it’s come down exponentially and I think it will be a shock as to how quickly the [cost] changes are going to happen. Though it has yet to announce when, Aberdeen is planning to introduce more hydrogen buses, as well as extend the bus routes to other cities. Buses aren’t the only hydrogen powered vehicles in the city, as the council is currently trialling a pair of Hyundai iX35 fuel cell cars, supplied by the CoWheels car club. The vehicles will soon be available for public hire and another two will be added to the fleet and made available for businesses to lease before the end of 2017.